Traditionally-crafted American furniture is celebrated for its blend of rustic beauty and durable craftsmanship. And the collections of custom-made, Amish-crafted furniture from Brandenberry are no exception. Take their splendid lineup of fireplaces. The craftsmen design and painstakingly handcraft each unit to perfectly balance timeless beauty and practical design in any home. The Eastown Fireplace, pictured here, exudes features which enhance the prestigious appeal of any living room or den. Notice, for example, its decorative corbels, raised panels, grand crown molding – and solid oak construction. Eastown’s designers inserted a 4,600 BTU power heating system. Plus, six full-functioning, multi-color flame settings, heat on/off control and a timer highlight the system’s many features. And everyone can enjoy looking at the fireplace through the glass doors. Also, homeowners and guests alike will love the easy-to-use remote. The fireplace can heat a 400 sq. ft. area. So everyone in the living room or den can feel the warmth of the Eastown Fireplace. Also, a 1-year limited parts warranty rounds out the fireplace’s awesome features. 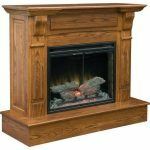 Customers can order the Eastown Fireplace as shown or as a corner unit. Or buyers can request a custom-built version. In fact, custom construction applies to every item Brandenberry offers. Options include a DVD/TV component opening above the fireplace, with or without a flip-down door. Homeowners can also specify swing-out sides for storing DVDs and CDs. But this feature does not apply to the corner version of this fireplace. There are three other options worth noting. The first is a TV lift on 33-inch wall units. With the press of a button, the TV rises from the back of the fireplace. Secondly, buyers can request that the fireplace be built with their choice of hardwood. Choices include oak, maple and cherry. And thirdly, you can order hearth drawers. Visit Brandenberry Amish Furniture in Shipshewana, Indiana, and discover the beauty of Amish custom crafted, solid hardwood furniture.